ZP_E. Pauline Johnson gathered together her complete poems, though others have since been discovered, for publication in 1912, the year before her death. 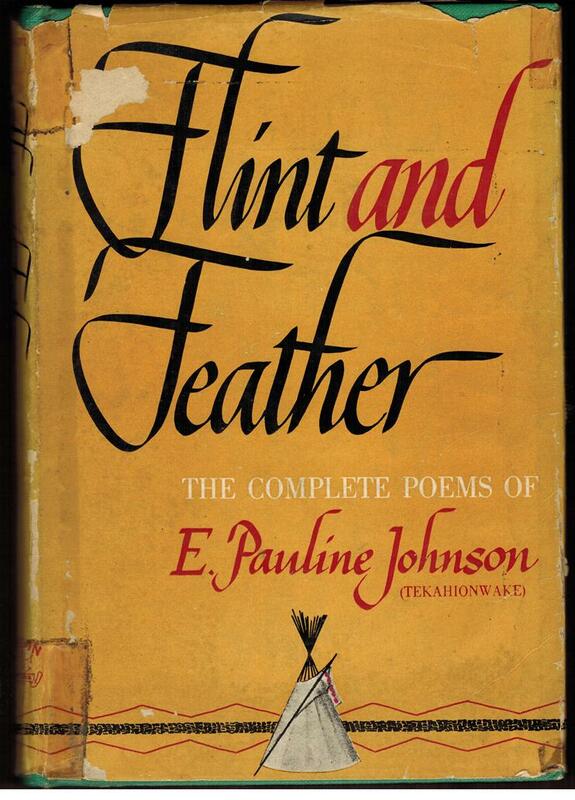 In her Author’s Forward to Flint and Feather she writes: This collection of verse I have named Flint and Feather because of the association of ideas. Flint suggests the Red man’s weapons of war, it is the arrow tip, the heart-quality of mine own people, let it therefore apply to those poems that touch upon Indian life and love. The lyrical verse herein is as a Skyward floating feather, Sailing on summer air. And yet that feather may be the eagle plume that crests the head of a warrior chief; so both flint and feather bear the hall-mark of my Mohawk blood._Book jacket shown here is from a 1930s edition of Flint and Feather. the language of the Cree. dead on the open plain. a woman to let alone. touch him now he’s dead. brought in your other hand. for the meat we eat. Or what you’ll suffer from the white man’s hand? Here is your knife! I thought ’twas sheathed for aye. ‘Twill drink the life-blood of a soldier host. 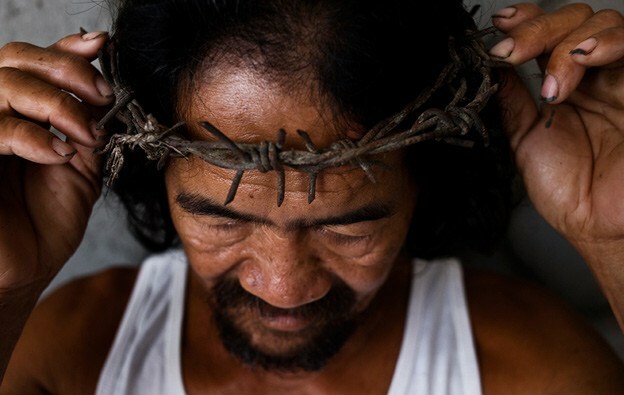 Giving what they gave us – but wars and graves. Who prays for vict’ry for the Indian scout? None – therefore take your tomahawk and go. Your tomahawk his life’s best blood will drink. Editor’s note: “the war” referred to in Johnson’s poem is The NorthWest Rebellion (or NorthWest Resistance) of 1885, led by Louis Riel. And scents the carrion awaiting him. A worthless prairie vagabond is he. To be devoured with savage greed and haste. And leaves her bones to bleach upon the plains. To wring some promise from the dormant soil. Realities of labouring for bread. Heat, cold, seedtime and harvest shall not cease. With fostering richness, mothers every grain. Emily Pauline Johnson (1861 – 1913) took on the Mohawk-language name Tekahionwake (meaning “double life”) around the time, as a young adult, she became aware of her ability not only as a woman who was writing poetry but also as a performer. Words such as transgressive and performativity – belovéd of academics in the 21st century – were words she mightn’t have known yet she “enacted” their meanings – and without the cadre of professionals to chatter about “who she really was”. And who was she – really? Well, she was complex – in some ways uncategorizable. A young woman who helped to support her widowed mother (her father, Brantford Six Nations Chief George Henry Martin Johnson (Onwanonsyshon) died in 1884) via the publication of her sentimental-exotic yet oddly-truthful poems; whose attachment to her father’s Native-ness was deeply felt during the onset of the Erasure Period chapter in First-Nations history in that New Nation – Canada. 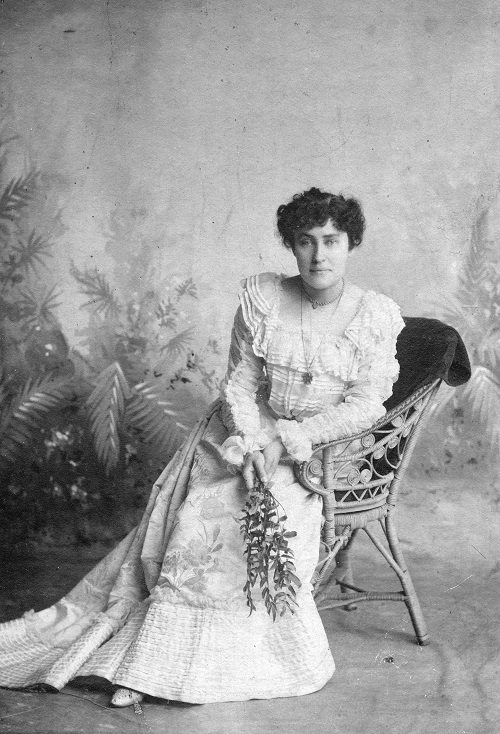 Pauline Johnson was mixed-race – Mohawk father of chieftain lineage, mother (Emily Susana Howells), a kind of English “rose” in a young British-colonial country. Enamoured of The Song of Hiawatha, and of Wacousta – Pauline was yet entranced by and deeply listened to the Native oral histories of John Smoke Johnson, her paternal grandfather. This was Pauline Johnson. Johnson stopped touring in 1909. She had developed breast cancer, and worsening health led to early retirement. Settling in Vancouver, she still wrote – adapting stories as told to her by her friend, Squamish Chief Joseph Capilano. Johnson died in 1913; a monument – and her ashes – are in Vancouver’s Stanley Park. We wish to thank editor Emily Landau of Toronto Life for her critical analysis of the career of Pauline Johnson. I do not feel the thorns so much today. It does not pierce my feet so much tonight.